The MIKE PERO MotoFest will encompass and showcase all things motorbike. 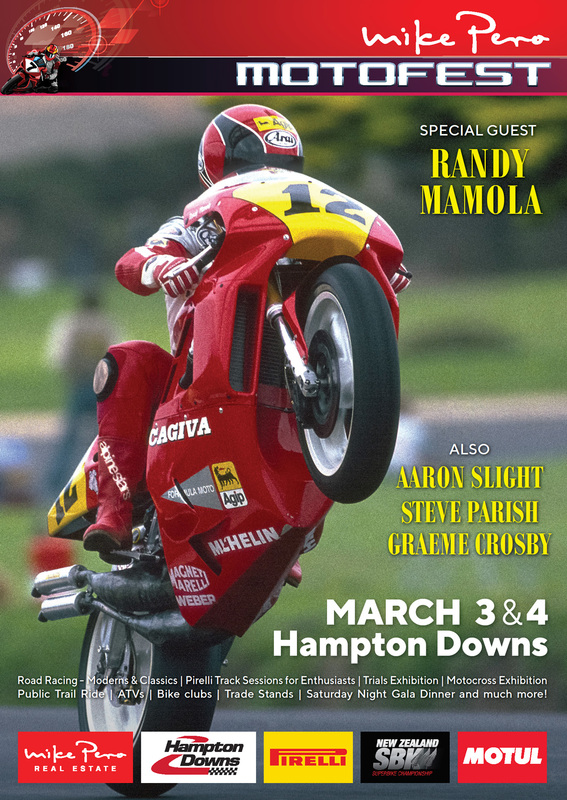 Moto GP legend Randy Mamola has been confirmed as the headline act for the event alongside fellow legends Steve Parish, Aaron Slight, Kevin Magee, Hugh Anderson, Andrew Stroud, Graeme Crosby, Richard Scott & Jeremy Burgess as well as Kiwi Motocross icons Shayne King, Josh Coppins & Ben Townley. The event, which takes place over the weekend of March 3rd and 4th will take on a festival feel and brings together all genres of the sport at one venue. Here’s the line up…. Enjoy demos from our legends twice a day over the Motofest weekend. Our Legends will be reunited with machines from the past for exhibition sessions. Legends line up as follows: Randy Mamola, Steve Parish, Aaron Slight, Graeme Crosby, Hugh Anderson, Kevin Magee, Andrew Stroud, Gary Goodfellow, Paul Bryne, Phil Payne, Jeremy Burgess. Expect to see Josh Coppins and Ben Townley contest the inaugural Hampton Downs Speedcross event. The event will feature Post Classic and Classic GP Racing. Round 3 of the 2018 New Zealand Superbike Championship will be contested at the MIKE PERO Motofest. With 10 classes, from Superbikes to Sidecars, the country’s top motorcycle racers will battle it out on track, culminating in the prestigious NZTT title on Sunday afternoon. A new Ben Townley inspired supercross short course, 4 rider sprint event will be a feature at the MotoFest. The race includes 2 major jumps and a challenging double U shape course. 12 of NZ’s best riders will contest the event which will take place from 4-6pm on the Saturday of the event. There will be a public trail ride (10-15km) on adjacent farmland, which will run for the entire two days of the event. This will be open to all comers. The track will be family friendly. A temporary track will be built on site in the heart of the track for a Stadium Trails exhibition and we have confirmed a field of NZ’s best riders. Track time will be available for amateur riders and enthusiasts thanks to Pirelli! Riders will be able to purchase 2 x 15 minute track sessions on either day, along with their event ticket. Take in all the action and get amongst it! We are expecting a massive congregation of bikes at the track each day. The very best road bikes, Harley Davidsons and more. Bike show participants will have the opportunity to cruise the track each day and show off their ride. Celebrate some of classic moments on the big screen and a Q & A with the Legends on Saturday night.